In the third stage of this meditation practice we let go of the counting and simply follow the breath as it flows in and out. This is the Mindfulness of Breathing proper, and if I were forced to introduce the Mindfulness of Breathing practice in two minutes then this is what I’d teach — simply paying attention to the sensations of the breath. However, by saying that I don’t want to devalue the earlier two stages, which are important aids in helping us to practice effectively in this stage of the practice and important practices in their own right. Set up your posture, as described in the posture guidelines, developing awareness of the body and relaxing as best you can. Then, becoming aware of the breath as the central experience within the body, begin counting after each out-breath, counting in cycles of ten breaths. When you notice the mind wandering, gently bringing it back to the breath. Notice the gently relaxing quality of the out-breath. Moving into the second stage of the practice, begin counting just before each in-breath, again counting ten breaths before starting over again at one. Notice the gently stimulating quality of the in-breath. When you feel ready, move onto the third stage. In the third stage of the practice, drop the counting, and just follow the breathing coming in and out. Pay particular attention to the transitions from an in-breath to an out-breath, since those are the places where you’re most likely to become distracted. See if you can notice the breathing as a continuous process — not as a series of in-breaths and out-breaths, but as a never-ending stream of sensation connected with the movements of the body, and the sensations of the air flowing into and out of the body. Is it just me, or time is very relative when your doing this exercise? I put an alarm on my cell phone for several minutes and they passed in a matter of seconds. I am very interested on your opinion about this matter. Thank you! Well, as they say, time flies when you’re enjoying yourself. When meditation’s a struggle, time can seem to crawl by, so it’s a good sign that you felt that time was passing quickly. Sounds like first jhana to me. Good! Wow! That feels good :) I had been feeling somewhat discouraged for the past week…just seemed like my meditations weren’t feeling very satisfying…felt a fair bit of resistance…so I was questioning myself a fair bit, as has been my lifelong tendency. So this was a good wake-up call to stick with things, and just accept what comes without judgment…without labeling things as ‘good’ or ‘bad’. Acceptance seems to be the general theme these days…it seems to be the antidote to struggling. :) Thank you so much for your reply! Ah, yes. It’s very important to accept the ups and downs of practice. That applies to the “ups” as well. It’s important not to get elated when we think things are going well. Good morning! I wanted to share some of what I experienced this morning. I feel as though I have finally had the experience in stage three that I have been reaching for. I have not allowed myself to move forward to stage 4 until progress has been made, and it’s been a disappointing couple of weeks. Today, rather than focusing on my hands as an anchor, I searched for my heartbeat in my chest. Once I found it’s rhythm, it sort of took over. My whole body seemed to sway slightly with my pulse and I could feel it through my whole awareness. My breathing became more natural, and my usual internal chatter was gone. I felt myself slip into a sort of trance state and my conciousness felt like it was floating above my body. I began to see and feel these warm ripples of light moving upward across what seemed to be my field of vision, but maybe it was more my field of awareness. They weren’t a focus or a distraction, they were just there. I had a couple of random thoughts sort of flit though my mind, but it was as if I was in a room with an echo and those thoughts came from somewhere else in the room. Then, the lights faded away, and my mind reattached to my body little by little. I am trying not to be carried away by my positive feelings about what happened, because then I will be trying too hard to make it happen again. What is this experience? Is it still categorized as mindfulness meditation? The focus on my breath is what got me there, but I wasn’t even really aware of my breathing toward the end. The after effects are quite lovely as well. I feel so relaxed and have a sort of soft tingly feeling throughout. With years of practice, is this something that people can have happen every time? Thank you for any insight on this. Sorry for the delayed reply, but in the last few days since you’ve posted I’ve had a family outing, an illness, and a day of intense work. The experience you describe sounds like an access concentration state that’s gotten a bit unbalanced. There are a couple of different kinds of “unusual” phenomena that can appear in access concentration — which is where the hindrances are starting to calm down and the jhana factors (roughly put, calmness, joy, energy, concentration) are beginning to emerge. One type is a bit “trippy” and a bit ungrounded, and that’s what your experience sounds like — in particular the detachment from the body and your description of this as a “trance” state. There are positive aspects to this kind of experience, obviously (the calmness, for example) but spiritually they’re not very useful. I wouldn’t suggest trying to recreate the experience. Often people describe flowing patterns of light, etc. Sometimes there are slightly unpleasant or disturbing sensations, which you don’t seem to be describing. These kinds of experiences tend to be more common in people who haven’t been meditating for very long. The other kind of experience (called a “nimitta”) that can arise around access to the beginning of jhana is superficially a bit similar, but more grounded. Nimittas can be images or sensations in the body, but they help us go deeper into jhana. They tend to be very stable, still, and esthetically pleasing. People who experience the first kind tend to experience the second kind as well, so I’d suggest steering your attention so that it’s more rooted in your physical experience. Stay in touch with the body. if you notice the “trippy” stuff arising, just note it and keep on with the practice. Sorry if this sounds like a buzz-kill! You’re definitely moving in the right direction, and you’re close to jhana. The problem is you’re taking a little detour, by the sounds of it. I stress the “by the sounds of it” because it’s always hard to interpret other people’s meditation experiences, especially when we’re not face to face. Good morning Bodhipaksa. I just realized that in my above message, I neglected to specify that I was writing to you! My apologies, and I am very much looking forward to your response. Ps. I’d also like to add that, surprisingly, my experience from yesterday’s meditation was closely repeated today! Although, not quite as deep, and the light pattern was different. Less regular and rhythmic. I noticed that my breathing becomes more shallow in that stage. Good morning. Thank you for you response. I did find it helpful, and made an attempt to redirect myself this morning. I tried again to focus on my hands, and it did seem to get somewhere. I began to feel my heartbeat throughout and the gentle sort of sway that comes with it. I made an effort not to get lost in it and kept my focus on my breath. For a moment those light ripples came again but I managed to send them packing. After a few minutes, I began to “see” this light in front of me. It was this soft oval glow, like a candle flame. As strange as this may sound, it felt like the light was looking back at me. It was only there for a moment, because then the recording started wrapping up and broke my focus. I think maybe I should move on to Stage four tomorrow? I definately felt that I could have gone deeper with more time. This whole process is getting easier now. I am no longer fighting with the need to control my breath and am having an easier time keeping my internal chatter at bay. I took a day off from meditation until I heard back, and noticed a difference in myself. I was less patient with my kids, and more tired at the end of the day. I am asking myself what I am hoping to get out of this practice. I can’t really answer that very well. I think I just want to move forward through life happier, more peaceful. And I am! I have been less caught up in the daily annoyances of life and feel an overall outpouring of happiness and love for my family. What do you think of the little light that was with me today? I definately was more grounded and felt like I was scratching at the doorway of something… Am I ready for stage 4? I suppose I should read it now. Thank you in advance for your response and guidance. Have a happy day. That soft glow looking back at you sounds much more like a nimitta. Yes, I’d definitely suggest you move on to the fourth stage. The refinement of focus in that stage may well be helpful. In the long term though you’ll probably find that you don’t really need to be dependent on “stages,” and that your meditation simply has its own internal dynamic, shaped by an awareness of what works and what doesn’t work. If the soft light, or something like it, reappears, then pay attention to the nimitta along with the breathing, and see what happens. It’s going to be important not to “try” to make anything happen. Any kind of grasping beyond a very mild effort to stay with the practice is going to be unhelpful, and it’s useful to think more in terms of relaxing into the practice. It’s hard to say what the next stage would be for you. It’s possible to move more deeply into jhana, letting go of thinking (that’s second jhana), then becoming more absorbed in the feeling of joy (that’s third jhana), and then moving closer in to the object of focus so that even joy is left behind and there’s a deep peace (that’s fourth jhana). That’s the samatha route. It’s also possible to simply be with your experience and let go of the sense of there being an experiencer and a thing that is experienced. That’s the vipassana route (or at least that’s one vipassana route). These are not mutually exclusive routes to take, and in fact both are to be encouraged. But I’d suggest that you mainly focus on deepening your experience of samatha by developing more experience of jhana, and from time to time relax so deeply into your experience that the experiencer/experienced division falls away. I have been meditating for one month, but with Deepak, where there is background noise. I have been told silent meditation is better. Then, I found your website. I am so greatful, because I really like it. I am at stage 3 of the breathing techniques and seem to think, I am doing fine as I feel I am able to focus on my breathing and body and become relaxed. During the meditation, I feel tingling in my hands and feet. Is this normal? Also, I suffer from anxiety and depression, but it is not severe. 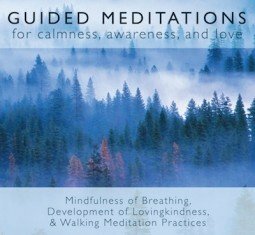 Do you think think I am on the right track with Mindful meditation and do you think if I continue doing it, I will begin to see positive changes in my thoughts and my well being? It sounds like things are going well. That tingling is what we call pīti, or prīti in Sanskrit, and it’s a good sign. When that appears in the hands, try relaxing your focus a little so that you’re aware of the whole body, and notice how the sensations in the body change with the energy of the in-breathing and the relaxation of the out-breathing. A few people experience a kind of pressure in the middle of the forehead while meditating. I’ve no idea why. But it seems to be quite normal, so I’d suggest that you just notice it as another sensation and let go of any anxieties about it.